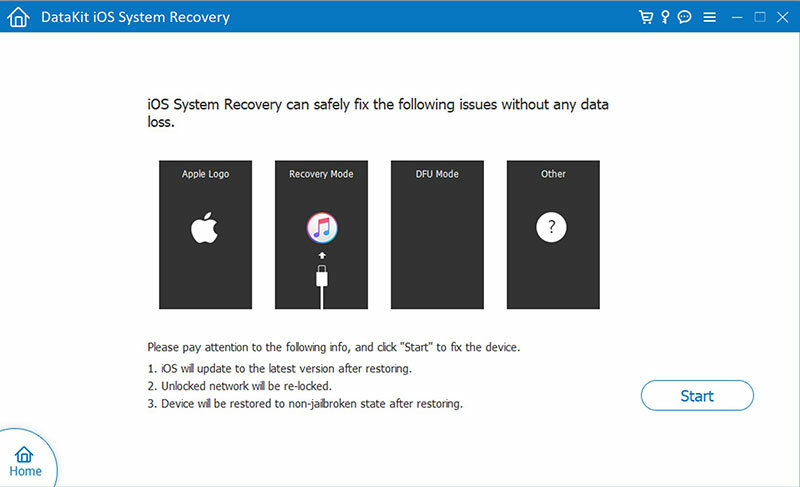 Recover iOS System Error With Ease. Fixing your iPhone/iPad with iTunes will take you a lot of time and you may lose your data. DataKit iOS System is super easy to use for a green hand. Just plug your iPhone/iPad to Windows or Mac and it will detect your device automatically. Just select the situation and follow the instruction, you will have all your iPhone/iPad errors gone and fix the iOS system back to normal. iPhone/iPad Errors That Can Be Fixed. iPhone stuck in recovery mode? iPhone is not responding? iPhone gets trouble into DFU mode. iPhone is in black/blue/red/white screen. iPhone shows the Apple logo. iPhone stuck in headphone mode. iPhone is frozen for some reasons. iPhone is disabled after unlocking failure. iPhone is in the loop of restarting. iPhone is in more abnormal situations. or it just stuck for no reason? iOS System Recovery will fix it for you. Download iOS System Recovery to fix all these things back to normal. It is very powerful with supporting all iPhone and iPad models including iPhone Xs,iPhone XR, iPhone X, iPhone 8 and iPhone 8 Plus, etc.